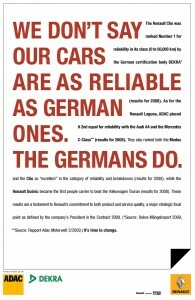 We don’t say our cars are as reliable as German ones. The Germans do. – Marketing, of course! Advertised in The Economist et al. A fine French advertising - well done Renault. Germany : France - 0 : 1. 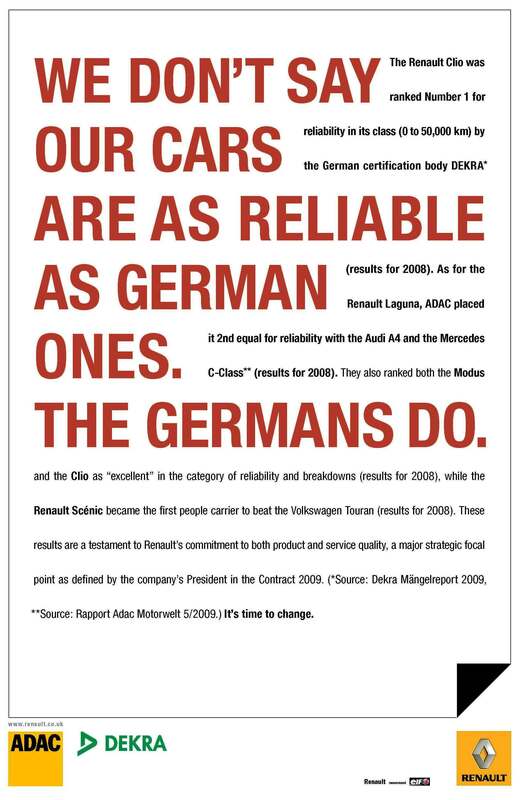 WE DON'T SAY OUR CARS ARE AS RELIABLE AS GERMAN ONES. THE GERMANS DO. The Renault Clio was ranked Number 1 for reliability in its class (0 to 50,000 km) by the German certification body DEKRA* (results for 2008). As for the Renault Laguna, ADAC placed it 2nd equal for reliability with the Audi A4 and the Mercedes C-Class** (results for 2008). They also ranked both the Modus and the Clio as "excellent" in the category of reliability and breakdowns (results for 2008), while the Renault Scenic became the first people carrier to beat the Volkswagen Touran (results for 2008). These results are a testament to Renault's commitment to both product and service quality, a major strategic focal point as defined by the company's President in the Contract 2009. Sources: * Dekra Mangelreport 2009, ** Rapport Adac Motorwelt 5/2009.